The aim of this study was to clarify the relationship between the length of the round ligament and the presence of a patent processus vaginalis (PV) based on the hypothesis that a short round ligament is the cause of ovarian inguinal hernia in female infants. 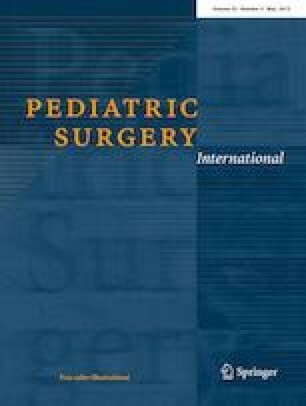 Between April 2011 and March 2017, 132 girls underwent laparoscopic surgery for inguinal hernia. Before surgery, the presence of ovarian prolapse was diagnosed. We observed the internal inguinal ring laparoscopically and examined the diameter of the PV orifice as well as the round ligament length. Medical records and video records were reviewed to evaluate PV patency and round ligament length. Seventeen of the 132 cases had an ovarian inguinal hernia; all of them were infants. In all infants, with or without a prolapsed ovary, the round ligament was short, causing the ovary and fallopian tube to be close to the hernia orifice over the pelvic brim. In girls aged over 12 months, the round ligament lengths on the hernia side, contralateral open PV side, and contralateral closed PV side were 33.0 ± 9.3, 36.8 ± 7.5, and 41.4 ± 8.5 mm, respectively. The round ligament length in open PV was significantly shorter than in the closed PV, but the difference was smaller in older patients. The round ligament, which is the female gubernaculum in the fetus, was shorter in the open PV than in the closed PV in younger girls. The short round ligament results in the ovarian prolapsed hernia. All procedures performed in studies involving human participants were in accordance with the ethical standards of Kawasaki Medical School and with the 1964 Helsinki declaration and its later amendments or comparable ethical standards. Approval for this study was obtained from the Research Ethics Committee of Kawasaki Medical School and Hospital (no. 2959). For this type of study, formal individual consent was not required.